We got to the protest site (at Southwest Community Church) around 6:45 since check-in for Love Won Out began at 7 a.m. We were there for about half an hour before two buses organized by the Unity Rally arrived. 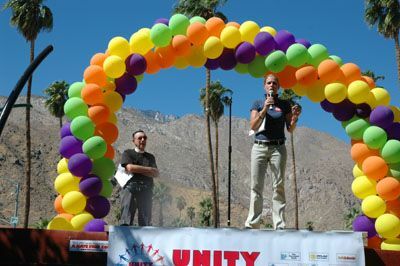 The Unity Rally was a coalition of liberal political, social and gay rights groups formed to provide a uniform voice in response to Love Won Out. Ex-Gay Watch ultimately decided to speak in our own voice and remain unaffiliated with the Unity Rally coalition. We planted ourselves firmly on the curb by the church’s main driveway and each person was given a sign they had picked the slogan for. Before the Unity Rally buses arrived several other small groups of private individuals arrived. 7 a.m. Rise and shine: Waiting to welcome conferees and protesters. 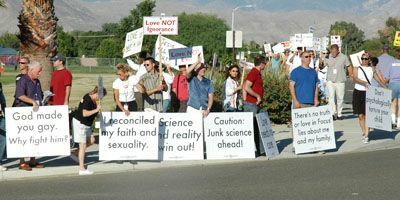 It’s interesting that when the protest group was still small was the only time anyone from the church came out to talk. A middle-aged woman with adorable short blond hair came out to see what we were all about and had a delightful, honest and civil talk with XGW author Timothy Kincaid for a few minutes. Once the Unity Rally bus protesters arrived one of the organizers gave instructions (via megaphone) to her protesters they were forbidden from engaging church members in any sort of dialogue as to prevent from being drawn in or entrapped into an uncivil argument by some evil nasty conference attendee. This was particularly disturbing since from first hand experience at the Dallas protest and now Palm Springs, I’ve found every single time someone walks from the church out to chat with protesters they are polite, friendly, civil and honestly want to talk. Unfortunately the short-haired woman was the only person to come out and chat the entire morning. It’s just a guess but perhaps once the two buses unloaded our numbers simply appeared too intimidating. From that point on we just got yelled at a couple times from cars but could never really understand what anyone was saying. Also I’d like to thank everyone who sent in questions for my press release which I gave to every member of the media I could find. Unfortunately since I would like to keep those questions a surprise, I’m not going to post the finished press release. I’d also like to thank a donor who bought all the foamcore board used to make my signs. Lastly, I didn’t know I had something white on my lens until I got home on Sunday. To maintain a friendly, light-hearted, and non-threatening atmosphere we greeted each car with waves and called out “good morning.” I’d say most people either smiled or waved back. 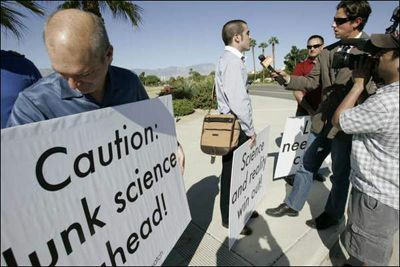 That’s XGW reader Scott H’s head on the left. 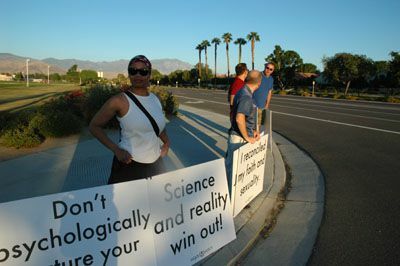 Science and reality win out! 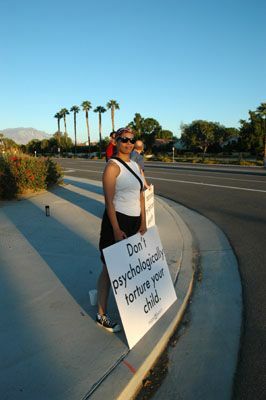 Don’t psychologicallly torture your child. There’s no truth or love in Focus’ lies about me and my family. I reconciled my faith and sexuality. You are the parent of a gay Christian. God made you gay. Why fight him? When the Unity Rally buses arrived those protesters were instructed to march in a loop up and down the sidewalk since their organizer had concerns about being cited for loitering or something. I was never really clear on their exact concern and so our group stayed firmly planted on the curb in prime view forcing the bus protesters to march behind us. I chatted with a sheriff watching the event who had no problem with us standing in one place and simply wanted to know how long we planned on protesting. Here’s the XGW group along the curb with the Unity Rally marchers behind us. There were just as many people on the other side of the driveway where I took the photo from. The two signs on the far left were extras I brought and were grabbed by bus riders who joined us on curb. Here are some people on the other side of the driveway. 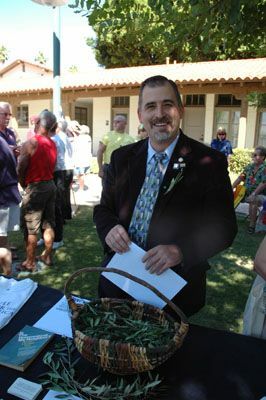 That’s Michael Bussee (one of the founders of Exodus) in the back in a black blazer carrying a basket of olive branches. 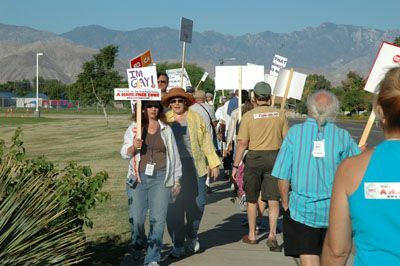 Fast forward to 11:00 that morning for the actual Unity Rally event held in a park in central Palm Springs. Before the rally began several groups had information tables set up. Here’s Michael Bussee again. The graphic below was used in virtually all Unity Rally materials. 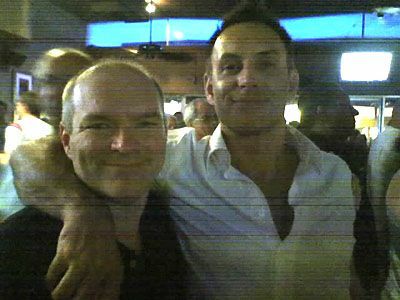 Jim Burroway (left) and Timothy Kincaid (right) at a local bar popular with sodomites later that evening. Thanks Daniel — almost feels like we were there! Apart from the descr., also good to see so many of you lot. Great shots. haha sorry didn’t mean to turn this into a dating forum but its good to see what the members of this great forum look like. Strange, you all look like happy, healthy homosexuals. Funny but it is not the image I get from reading the pages of Agape press. You guys look GREAT! Love the posters. But wasn’t it HOT out there in the desert sun. You all look like you didn’t even break a sweat. Must be one of your queer superpowers. It seems like you had about as good a time as us and Peterson had in Malmö, and that is not bad. Funny how the meaning of the words social agenda and genuine helpfullness can be completely reversed. I’m glad you mentioned the fact that the people at the Unity rally were uninformed about exgay issues. It would parallel the experience I had when I faced off against some anti-gay protestors in San Francisco who were protesting a gay prom. None of them were even remotely informed about exgays or Exodus, though they had Exodus literature in hand. In fact, I knew more about Exodus than they did. We were also told to avoid talking to them, but I never listen to anyone telling me what to do. I engaged the protestors in conversation which diverted a lot of them from the protest since I was educating them and showing them how Exodus would never allow the ugly hate signage they were carrying. One of the things about Ex-Gay Watch that I appreciate is that you have a relentless mission to be fair and honest to the other side. This is what gives your site integrity. Aren’t you sweet to say that. I’m not gay, but a very cute lady from Birmingham thought I was a lesbian as she was and asked me about what my adolescent crushes were like when I was young. That’s when I realized…oops, she thought I was gay. Personally, I think I must be doing something right if I fit in that well with my gay loved ones. Respectfully, I appreciate being so wholly accepted in the tribe and welcomed to help communicate what we can do TOGETHER gay and straight, to make this a better world. It was a beautiful morning, that always helps the mood. I would have liked to have talked to those parents and young people going in there up close and really been able to assure them that change is possible: changing to an accepting family. I don’t know if its true that the attendees of LWO are more misinformed than hateful, but I don’t think that can be said for the organizers and leaders of Focus/Exodus/Narth I don’t see where their overt anti-gay political actions can come from a place other than hate and ultimately if the attendees are misinformed by those motivated by hate their actions and attitudes towards gays will be the same as those hateful leaders. I think it is fair and honest for the Unity Rally’s people to call the results of LWO hate, much more honest at least than for “Focus on the family” to call it love. Daniel and all, I didn’t hear you complaining about the bastardization of the meaning of love in this thread which is a much more glaring misrepresentation of reality. If the attendees were calling this event love that’s willful ignorance at best. I arrived at 4:30 am stopped at a nearby park to look at the stars, collect my thoughts and pray a bit. 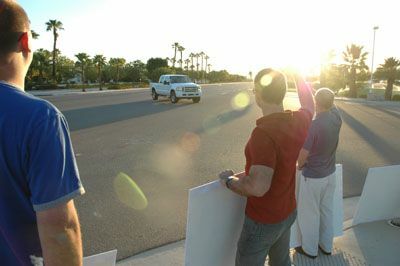 Then, the “protest” bus came and we headed off to Indian Wells. It didn’t feel like a “protest”. In fact, I had a great time, met some really nice people and enjoyed the peaceful, morning walk outside the church. It was relaxing and raised my seratonin level. The exercise and the sunshine did me good. It was actually a positive and relaxing experience for me after weeeks and weeks of furous blogging and telephoning. Throughout the day, I was struck by the fact that (apart from the event organizers and you guys from EGW) almost no one I spoke to at the “walk”, the Unity Rally in the park, at dinner that evening or at Toucan’s bar that night knew much about events of the day. They knew very little about EXODUS and NOTHING at all about NARTH or Dr, Nicolosi. Most folks, I reminded myself with a smile, have much better things to do on a beautiful Saturday in Palm Springs. Someone commented that I “had a nice basket”. I am sure they were referring to the Olive Branch basket. I changed into jeans and casual shirt and looked for you all at the Toucan’s bar. It was pretty crowded. I got my diet cokes for free! None of the patrons there seemed to know what had gone on ihat day. They were too busy talking with friends, having a cocktail or watching the go-go boys start to dance. That’s when I decided I was too tired out to stay. Sorry I missed you guys. As I drove out of the desert on my way home to Riverside, I felt pleased that the day had been a peaceful and affirming one. A friend on mine attended the conference itself. She said that some of the testimonies of “change” were “powerful” and that the conference itself seemed to go well. No mention of the NARTH controversies. Yesterday in Church, our pastor spoke on “Christian Idealism” and loving your neighbor — even if ( or maybe especially if) we disagree with them. I thought it mirrored what happened Saturday in the Valley. Michael, sorry we missed you!! We left Toucan’s about 10 or 10:15 and went to Hunters. I thought the organizers missed an amazing opportunity when they decided not to invite you to speak at the rally. I, for one, would have found that to be much more relevant than the Captain and Tenile song. I also thought that Daniel’s “testimony” about his therapy with Nicolosi would have been powerful and effective. Surely it would have been more effective than a history of who called whom to set up which committee to organize the oversight of the committees to select the committee for the organization of the event and the members of each. (Ok that’s an exageration, but only slightly). Here is a Desert Sun video clip that has Timothy speaking eloquently about last quarter of the clip (I don’t know who the first person speaking is). …more relevant than the Captain and Tenile song. One of the news articles mentioned “Love Will Keep Us Together.” Oy. Did any former ex-gays speak? There was one guy, the local MCC pastor, who had been to a previous LWO conference. He also spoke as a psychologist about the motivations of LWO (he was the one who discussed LWO being motivated by fear and misunderstanding rather than hate). Other than that, I don’t recall the ex-gay thing being mentioned. And Timothy was dancing around the rally like a mad man. No former ex-gays spoke, nor were they invited to speak as far as I know. Even though the rally organizers were made aware of their presence. And two karaoke songs. I had blocked them out of my mind. Thanks for reminding me of “Love will keep us together” 😛 Mercifully, I still don’t remember the other song. The first speaker was someone who just showed up with his partner about the time we got started (and long before the buses arrived). It was great to have him along. (Also, you could hear us yelling “Good Morning” in the background as he spoke). That was a nice contrast to the later shot of rally people walking in a circle with the bullhorn lady keeping everyone in line. Seriously, I walked away thinking that our supposedly more “experienced” were rather pathetic. The whole time, the message I got was “we know better, fall in line.” A little less arrogance on their part would have gone a long way. Their approach was ineffectual at best, and (IMO) detrimental in some ways. Nevertheless, I also walked away with an even greater confidence in our approach being the right way to go. I’m talking about the guy in the video that David Roberts linked to, not to any speakers at the rally. Sorry for being unclear on that. No former “ex-gay” spoke. It might have been powerful for the audience to hear a story or two about what it is really like to go through an “ex-gay” ordeal. I think most people really had no idea of what the debate was about — only that an unwelcome, right-wing republican, anti-gay “roadshow” had come into town to try to “divide their community”. They may be right. One of the organizers did say she was planning to mention from the podium that one of the original “founders” of EXODUS was “on grounds” at the information/leterature table to answer any questions folks might have — but it may have slipped her mind. Another organizer (as I was getting onto the bus with my basket of Olive Branches and my little card that read “Do unto others as you would have them do unto you”) — asked me to be “low key” and only “offer” a card or Olive Branch. She asked me to be careful not “push them”, since “some people had expressed discomfort with the religious message”. She reminded me that this (the protest and rally) was a “LOCAL expression of THEIR civil rights.” I responded, politely, that I was there for similar reasons and was grateful for the opporunity to express my own. I did as she asked me to do, and many folks on the bus asked for an Olive Branch as a symbol of non-violence and mutual respect. As for speaking AT the rally, I think they might have allowed me to if I had been clear that I would have been interested. I didn’t want to promote myself or “step on any local toes”. I really felt it was their show. And it was. Having reflected on this further, I think there are things we could have done ourselves differently that might have had an impact. We clearly need to educate our own LGBT advocates on the particular issues facing ex-gays (and ex-ex-gays). I think a lot of our differences in approach _might_ have been avoided if we could have provided a packet of information aimed to summarize our knowledge of the ex-gay movement, the issues faced by people who voluntarily (and involuntarily) join the movement, and the motivations of parents and relatives of gays who attend these conferences. We (actually, you) have a great website with lots of information. Maybe we need to find some key parts and consolidate it into concise, stand-alone documents targeted to wards particular audiences — kinda like Focus does. What a beautiful day. So sad that people spent it listening to advice on how to make their children, neighbors, and co-workers miserable in Jesus’ name. What an interesting and thought provoking post and an example of putting thought and passion into action. I think your post makes the argument for informed dissent. It appears we are all prone to uniformed dissent. And when we do the latter, we can only reinforce our ignorance through demonizing our real (or, now, imagined) opponents. I want to offer a big Thank You! to the contributors of EGW (and other attendees) for what they did this weekend, and for this great update on what happened at the protest/rally. I wish that during my ex-gay stint, I’d have been confronted by people like the EGW people, rather than the gays that were so quick to call me a “hate mongerer” “fascist” or “self-loathing queer;” generally in a hostile manner. Perhaps it wouldn’t have made Exodus so appealing and would have saved me years of heartache and self torture. I wholeheartedly agree with Jim that more education needs to happen about ex-gay and ex-ex-gay (re-gay?) issues. I’ve tried it with my LGBT friends though, and realized it’s not as easy as one would think. Anyone have any suggestions?  Michael Bussee: It’s great to learn that you’re a real person! I know that sounds odd, but I’d always just heard you discussed as a dismissable myth in the group I attended. Kind of like Bigfoot, but in a less Pacific Northwest sort of way. Anyway, it was great to learn about you and encouraging to see your involvement. For those of us who listen to NPR in Los Angeles, Air Talk with Larry Mantle mentioned the LWO conference in its program on Wednesday, September 27. RealPlayer audio of the program is available online. I am so dissappointed by all the negative comments on this website. You seemed to be more interested in the costs of your signs and how the organizers of the Unity Rally did everything incorrectly. What about why we were all out there that day?? Don’t we have enough negativity from outside our community? I am proud that I was a part of the Unity Rally!! I am also very proud of all the work that the organizers did to put this event together. They did a GREAT job!! 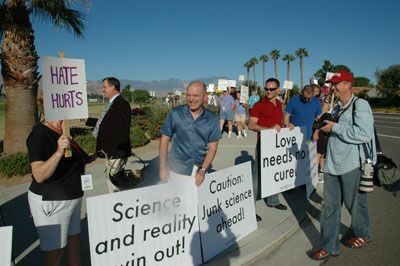 I am happy that I live in the Palm Springs area – A HATE FREE ZONE!!! The “unity rally” events and message was poorly conceived and executed for the most part by people who have no real knowledge of the ex-gay movement. The “unity rally” chartered busses didn’t even arrive at the protest site till half of the ex-gay conference participants had arrived. The “hate free zone” slogan was overly simplistic and frankly was more focused on name calling and ultimately harmful accusations of “hate” than addressing specific grievances. If you wish to embrace mindless slogans and criticize independent thought within the gay community then this isn’t the best site for you to be reading. Last weekend Desert Oasis Chapel held a pro-gay conference in response to Love Won Out. Unlike the “unity rally” every speaker at Love Breaks Out had first hand knowledge and experience of the ex-gay movement, nor did speakers make accusations of “hate” against their fellow Christians. How many organizers from the “unity rally” came to Love Breaks Out? ONE. Hmmm. 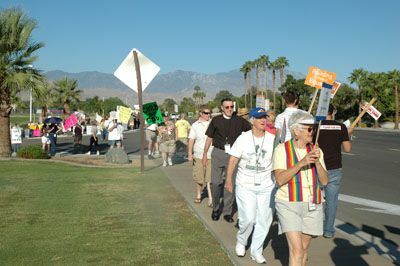 How strange to read negative comments about the Unity Rally in Palm Springs when everyone locally I have talked to since the event has had nothing but good things to say about it and gratitude for those who put it together. I was a part of the Unity Rally, a locally planned, one time response to a (hopefully) one time local event. The rally was created by people who do not do this for a living or do any sort of work like this on a consistent basis. It was created to offer a peaceful response showing that we are a unified community of gay and straight people, and that the message Love Won Out promotes is not welcome here. The idea originated over coffee at a local cafe by people who were stung by the fact that a group like Love Won Out would come here to promote their anti-gay agenda. Contrary to your belief, the main organizers of the Unity Rally spent a lot of time informing themselves about the Love Won Out group and the anti-gay Chistian movement. These arent pro’s in the field of political protest, just local people that were willing to try to come up with a response to a situation. Trying to give one voice to a large community can be a difficult thing, but it was needed. As for the word Hate, well, you’re right – it is a strong and negative word. The Hate Free Zone was used to reflect a current nationwide “Hate Free City” campaign – that’s where it came from in this verbiage. And quite frankly, after reading and studying the Love Won Out group and their focus, we all know that while they preach Love, they hate the gay part of themselves and others, so it isn’t exactly off the mark. The controls set up for the Unity Rally marchers at the conference, while they may have gone to the extreme, were put in place in hopes that the often intense anger many people here felt towards the Love Won Out group would not result in name calling and over-reaction by participants. If it made it a little too sterile for you, well, so be it – it worked. It was known that other groups would be there protesting in their own way, as yours did. As you did, the Unity group smiled and waved as they marched. All good, it would seem to me. From what I heard from the locals who were there marching with the Unity Rally group, they were proud of the way it went and proud to have taken part. Just as you obviously are about your part in the protest. As for speakers at the rally downtown, had you attempted to look at it and hear without bias, you would know that it was a mix of people; nope, no members of the ex-gay Christians, but there were ministers from local churches, local openly gay and lesbian members of our city council, the main conference organizers, and two young men from local gay youth associations (who were nervous as hell before going on stage because neither had ever addressed this kind of a crowd – but who were willing to do it to speak for the cause.) I thought that they along with the other speakers did really well. The songs you seem to dislike so much were sung by a local openly lesbian entertainer in an effort to bring some light and music to the event. How you can be offended by “Love Will Keep us Together” and “Love is a Wonderful Thing” is hard for me to understand, but to each their own. I was there watching – most of the crowd was clapping and singing along… maybe the one not hearing the words was you? As for self congratulations, it appears to me that you indulge in your share. It is probably well deserved for the work you do and have done, but that really doesnt make it any prettier from my perspective at this point. When people anywhere are willing to take the reins, make a stand for what they believe in, and give their time and energy to form an event, I believe they should be given a margin of respect. It might be good for you to remember this next time you put so much energy into putting them down. 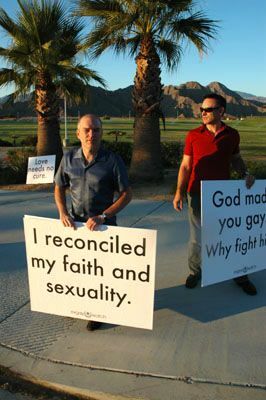 2) help gay-affirming protesters better understand ex-gays from the perspective of former ex-gays. Ex-Gay Watch offered to participate in the Unity Rally and to provide the organizers with background information. If the Rally organizers needed a speaker, we were ready to offer one, provided that the rally was politically nonpartisan. We didn’t receive a response to our offer, and in time the rally became partisan so we stepped back. 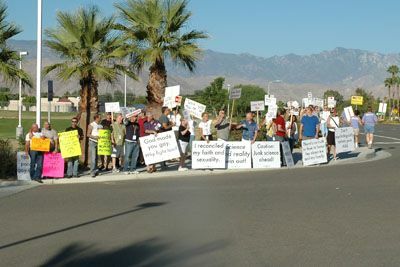 I’m glad that the rally helped to unify a portion of the gay Palm Springs community. Yet I believe both the Rally and the local community would have benefited greatly from first-hand knowledge of the ex-gay movement. The local sexual strugglers who are lured and recruited by Love Won Out events, only to be exploited and torn apart by Exodus and Focus on the Family later, needed to hear local voices of welcome and support from people who have been through the same struggle. They needed for their personhood and spirituality to be acknowledged — not suppressed, ostracized, or dismissed as hateful. I respect the intent of the Rally organizers to rally local community support for equality as well as opposition to out-of-town antigay political activists. The Unity Rally met its limited objective. But it could have done better. And I hope a future rally will do better, the next time an “ex-gay” event comes to town.